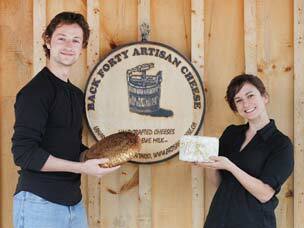 Jeff and Jenna Fenwick are the new owners of Back Forty Artisan Cheese, located in Lanark Highlands. Local favourite Back Forty Artisan Cheese has two new owners at the helm: Jeff and Jenna Fenwick. Founded on a small sheep farm in 1999 by James Keith and his late wife Elizabeth Harker, the business grew into a favourite amongst cheese lovers and became a leading producer in Ontario. 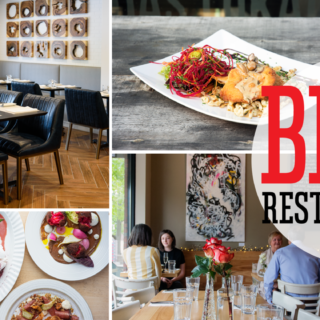 City Bites spoke with Jeff about taking over the business and where Back Forty is heading. What did you do for a living before taking over the cheese business? I’ve had a variety of sales and sales management positions specializing in water treatment, organic and free range foods, and most recently I was the Director of Admissions for a large private college. I’m also a professional motorcycle racer and have enjoyed many years travelling and competing in Canada. 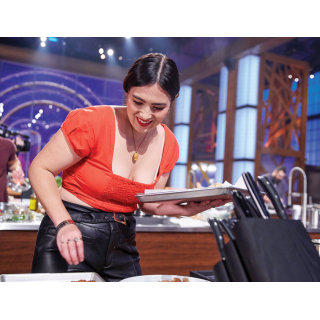 My passion has always been quality food and cooking great meals for family and friends to enjoy. Where does your interest in cheese-making come from? I don’t have a farming background. But I grew up on some acreage on the outskirts of Guelph and was always surrounded by farm lands and nature. I’ve always had a strong interest in cooking. My wife and I enjoy the slower pace of preparing a large meal, growing vegetables, preserving and, of course, eating quality foods. I like creating things, especially for my friends and loved ones to enjoy. How did you learn about the sale of Back Forty and what was involved in making the decision to take it over? I became aware of the sale of Back Forty Artisan Cheese through my in-laws, whom reside in the Perth area. They saw the advertisement in the local paper and brought it to our attention as they knew we were looking for a change and right away thought this would be a great fit. At the time I was involved in a high-stress management position for a very large U.S. Corporation and was in desperate need of making a lifestyle change. For years I had been saving to start up my own venture and looking into opportunities, restaurants, cafes, etc., that would allow for self-employment and complement my passion for food. The decision to purchase Back Forty was simple. It seemed as though the stars had aligned and everything just fell into place. I set up a meeting with Jim and drove up from Hamilton during a snow storm. My wife Jenna couldn’t make the trip, but thought it sounded perfect for us and trusted I would it know if it was when I got there. As soon as I drove down the long laneway, surrounded by beautiful snow capped trees, I was sold. Jim showed me around the farm, we talked about the business, lifestyle, and my aspirations for Back Forty. I didn’t need to do any research or give it much thought. 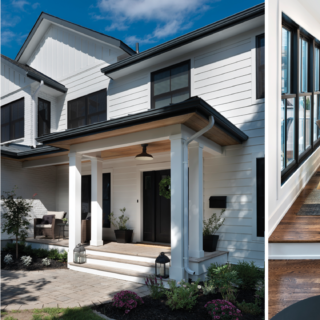 It felt like the right move for us and was exactly what we were looking for — a chance for us to escape the rat race of big city living in southern Ontario. Back Forty perfectly aligned with how I wanted to be spending my time. I knew Jenna would feel the same way, so we purchased the farm and business on the spot. Where does the milk for the cheese come from? All of our cheese is made with high quality raw ewe milk. All of our milk derives from one flock of British Milk Sheep. The small family-run Ontario dairy farm is owned and operated by a hardworking Amish family that care deeply about the environment and their animals and are committed to the highest animal welfare practices. What has been involved in taking over the business from Jim Keith? I apprenticed with Jim for several months leading up to the spring to ensure I had a solid foundation to carry on the prize-winning recipes. Jim introduced me to his loyal customers, suppliers, and distributor and has been very supportive. I’ve spent numerous hours studying microbiology, food safety, and sampling cheeses from around the world. What has been the greatest challenge so far? The best part? The biggest challenge has been working with an organic product. Cheese is alive and the chemistry changes greatly depending on the milking season, weather conditions, environmental changes, etc. I’m learning how to adapt the recipes to suit the given circumstance. It’s been challenging, but I’m learning everyday and enjoying the process. The best part of owning Back Forty Artisan Cheese is being able to spend my time doing what I love each day with my loved ones close by. Jenna has her own hand-printed textile business (www.jennarose.ca), which she also runs from her home-based studio. Having us both working and living side by side on the farm everyday has been a great pleasure. In addition, the slower paced lifestyle is a great escape from the constant pressure of “more sales, more profits,” which I received in the corporate world. I’m now able to make and eat cheese every day. It’s fantastic. Will you be changing anything about the production of Back Forty cheeses? Back Forty is a small scale, handmade cheese operation. There is no fancy automated vat to stir and cut the curds, no mechanical presses, or quick and easy methods. Everything is done by hand using traditional old world methods and I intend to keep it that way. The only changes to production will be an increase in production by crafting more batches to keep up with the growing demand. Will all of the established varieties continue to be available? Yes, all four varieties of Back Forty Cheese will remain available, and I’m working on a new washed rind cheese that I hope to launch in early 2013. Is the cheese currently available at all of the places in Ottawa listed on your website? With the change of hands over the winter, spring, and early summer, inventory has been a little low. I’m making cheese daily to ensure all of our stores will have a good consistent supply for the fall. Currently, a small amount of our cheeses can be found in most of the Ottawa stores and all four varieties are typically available at the Carp farmers’ market. For more information on Back Forty Artisan Cheese, see www.artisancheese.ca.